The HDMI + VGA + Stereo Audio + Composite Video + Audio over Cat5 kit is a complete solution for the extension of HDMI video and audio, VGA video, Stereo Audio, Composite Video and Audio signals over three Cat5/Cat5e/Cat6 unshielded twisted pair cables up to 300ft. HDMI video is supported at up to a 1080p video resolution while VGA is supported at up to a 1920x1200 resolution and Composite Video is supported at a 480i video resolution. HDMI digital audio is supported through the HDMI port, while the 3.5mm port supports Stereo Audio and the two RCA Audio inputs of the transmitter accept a Stereo Audio input, mix the two channels of audio into a single signal which is sent to this receiver then duplicated so that both channels of audio are sent to the white and to the red RCA output ports on the receiver. 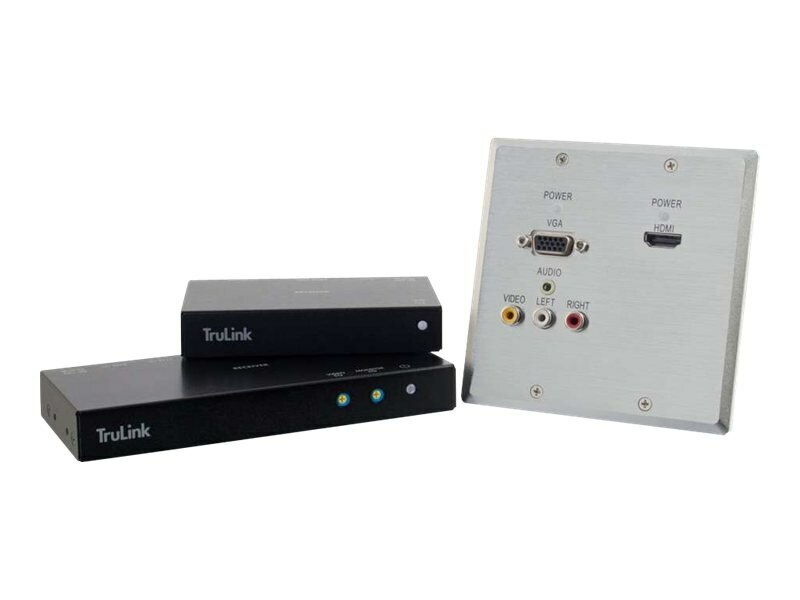 This solution is compatible with any operating system and is truly plug and play with no drivers or software required. In addition, this solution utilizes TruChoice power providing the flexibility to power at either the transmitter or receiver end. TruPair technology and HDBaseT ensure compatibility with any monitor. Built-in power surge protection and high ground loop immunity ensure high performance signal extension. Extend HDMI, VGA, Stereo Audio, Composite Video and Audio up to 300ft at a 1920x1200 resolution. Utilizes three category cables for extension. HDBaseT technology supports EDID pass through. TruPair technology ensures compatibility with any monitor. TruChoice Power allows for power at transmitter or receiver end. Kit includes both the transmitter and receiver units.